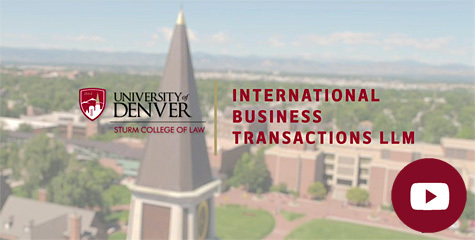 With the support provided by a generous gift from the Roche Family Foundation and Denver Law alumnus Robert Roche, JD ’88, the International Business Transactions (IBT) program delivers comprehensive and internationally relevant business transactions training in a variety of core areas. 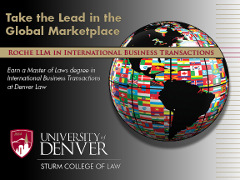 The Roche IBT LLM leverages the strengths of Denver Law’s International Legal Studies program, the Corporate and Commercial Law program, and the University of Denver’s nationally ranked graduate schools of business and international studies. Graduates of the program are well prepared to take their place in the world of international transactions law. 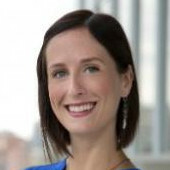 Upon successful completion of this degree, practice-ready graduates will have a strong grasp of international business and transactional law gained through an extensive curriculum in the areas of trade, commercial arbitration and dispute resolution, international intellectual property, banking, investment and finance. It pays to pursue a graduate degree aligned with your career ambitions. The flexibility of the IBT LLM program and the variety of course offerings allows students to tailor the degree to their specific interest and career goals. Courses are taught by expert academic faculty and practitioners who are committed to providing an advanced legal education with an emphasis on Sturm College of Law's integrative experiential learning approach. Through the attention, support and guidance given to each student, as well as the high standards of academic excellence and our rigorous practical learning, IBT LLM graduates will competitively position themselves regionally, nationally and globally.